The approaching digital conversion date of February 2008, makes everybody nervous. Congressional leaders, led by Rep. JOHN DINGELL and EDWARD MARKEY, are convinced that the analog shut-off is a public disaster to happen. If you ask someone in Washington when and how the Analog to High Definition TV conversion will be solved, the usual answer is: We don’t know. Digital conversion’s greatest impact will be on the 20 million households without cable, proud owners of old analog TV sets. To watch TV after February 2009 they must purchase and install special Digital/Analog converters. Now, American households have more than one TV set, so we are talking about 50 to 60 million converters. Neither a small number, nor a negligible expense. While those 20 million old TV sets represent a serious HDTV challenge, the Cable TV industry’s conversion to the HDTV age is not free of potential technical problems. A case in point is CLEARVIEW CABLE, serving Harford, Md and South York, Pa counties. The system carries the popular HARRISBURG, Pa. UHF TV stations Channels 21 and 27. After the analog cut-off they have no other choice, they must switch to the stations HDTV affiliates. The HDTV affiliate of Channel 21 is Channel 4, WHP-DT and for Channel 27, it is Channel 10, WHTM-DT. 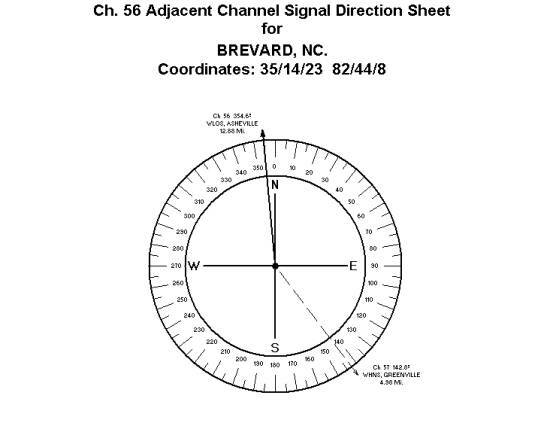 The reception of these VHF stations represent a serious technical challenge, as demonstrated with the aid of the following Co-Channel Signal Direction Sheets. Note the extremely low 2.3 kW output of Harrisburg, versus the powerful 100 kW Washington station. The Washington transmitter is only 24% further away than Harrisburg. The implications are obvious. The FCC approved digital affiliate channel selection is less than desirable. 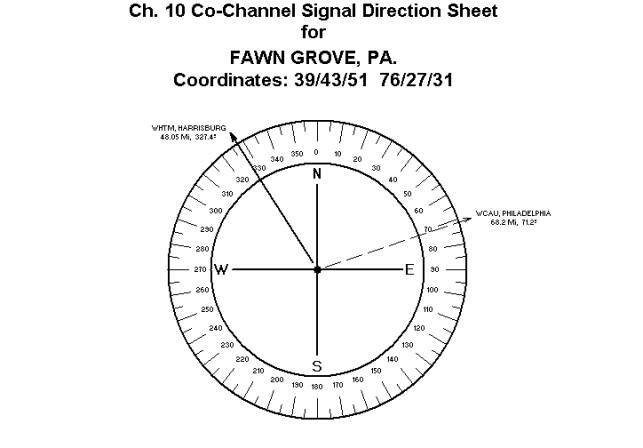 The high output power Philadelphia transmitter, only 29% further away than the desired station, will affect the reception of Channel 10, Harrisburg. An elaborate phased antenna-array is needed for interference protection. The FCC approved digital affiliate channel selection is quite unfortunate. Our research indicates that the improper DTV affiliate channel selection is not limited to Pennsylvania. Similar problems may cause head-aches for CATV operators in every state east of the Mississippi. In North Carolina, the Brevard CATV system carries Channel 13, WLOS, ASHEVILLE, an ABC network station. After the analog cut-off date it must be replaced by the HDTV affiliate, Channel 56, WLOS-DT, Asheville. 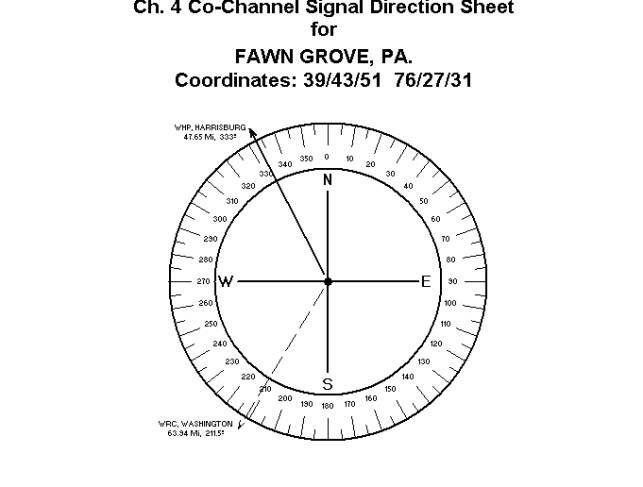 Channel 56 reception troubles are demonstrated on the Signal Direction Sheet below. The undesired adjacent channel digital TV station is located 2.6 times closer than the desired! The Channel 57 adjacent channel DTV interference can be considered a daunting but hardly insurmountable obstacle. Remember that the usual solution of installing of a bandpass filter or a trap does not work on UHF frequencies. The application of a properly designed and installed phased-array is mandatory, but under the given unfavorable distance conditions picture quality cannot be guaranteed. Another case in point is the selection of Channel 12 as the DTV affiliate of CH 20, WTXX, Waterbury, Ct. 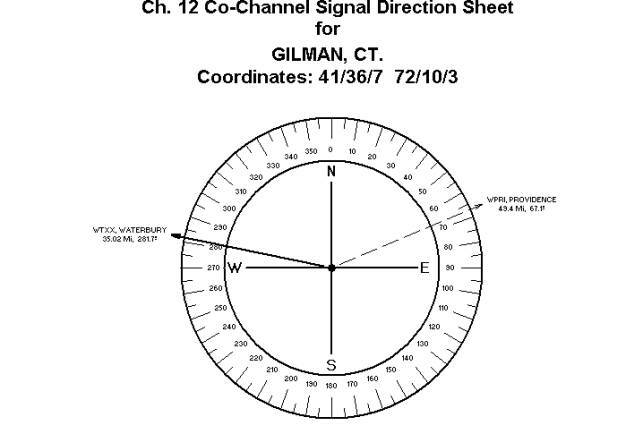 Observe the distances and output powers involved in GILMAN, Ct.
How do you ascertain interference elimination when the undesired station’s output is 316 kW versus the desired’s 2 kW, and the distances are almost equal? Not even Biro Engineering’s custom designed phased-array can guarantee the necessary co-channel protection 100% of the time. Hardly rocket science, you might say, but the development of these Signal Direction Sheets have given the HDTV affiliate channel selection process a radically new perspective. Biro Engineering’s Signal Direction Sheet services are available to everybody in the CATV industry, including the staff of the FCC. It is still the best way to identify potential HDTV reception interference situations, or to search for interference free solutions. The best time for corrective action is now.